I haven’t written for a while. Truthfully, I found my summer and fall so busy and overwhelming that I needed some down time to follow. Like the earth, I needed to lay fallow, and sleep, and dream, and think. Winter is such a perfect time to revisit the process and pace of the life that preceded it. And boy did it feel good. Now, don’t think for a moment that I was unproductive during this time. It would fly in the face of my very nature, and make me miserable into the bargain. So I knitted. A lot. 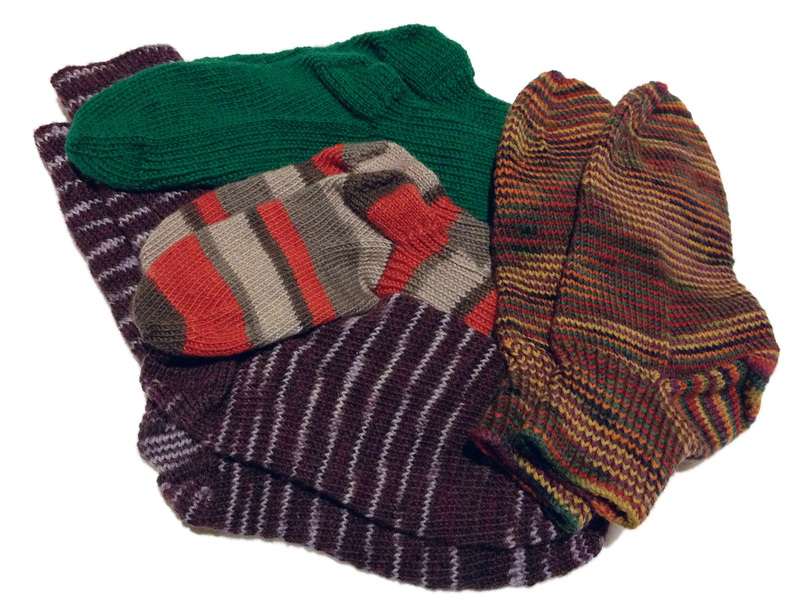 I knitted five pairs of wool socks in the six weeks leading up to Christmas, which is a personal record for me. The knitting didn’t end there either, the socks continue, and I’ve started a sweater. There’s also a wool scarf on my loom. And if that isn’t enough, I spent part of my weekend with some of the local ladies, spinning up some old wool roving from my stash. As if I don’t have enough yarn. I’ve come to realize that the winter is such a necessary time for my peace of mind, and my mental wellbeing. That this burying myself in wool, this total immersion into the realm of sheep, satisfies a curiously old instinct in me. Frankly, it just feels right. Now, I guess it shouldn’t be surprising. The process of turning fleece into clothes is one older than history. It is also one that is particularly suited to winter time, it being almost impossible for me to justify sitting down for any length of time in the summer. The temperatures here bring back the winters of my childhood, and I have realized that I let the woolens section of my wardrobe get quite shockingly low while basking in the warm Bostonian winters. And while I could buy what I need, again… there is that curious tug inside me, that thing that blooms into full blown pleasure at having made something with my own hands to keep my family warm, protected from wind and cold. What is more interesting still is to see that same satisfaction reflected in my loved ones, the simple pleasure of wearing hand-knit socks, and the way mommy-made clothing is more treasured than the store-bought kind. Even by my four year old son. I wonder if this is something lost or mystical, some arcane secret kept all these generations by mothers and grandmothers, aunties and matriarchs. This magic of handmade, as though we knit the spell of warmth into the garment, as well as our love. I know I am not alone in this observation. It is there, in the hands and the eyes of my knitting friends, both spoken of openly and carefully avoided. It is the reason we knit for babies, to cloak them carefully in this protective thing. It is the reason we send our husbands and lovers out into the cold, their feet encased, their heads covered by our love. Nephews, daughters, brothers, sisters, sons, and nieces. We knit for friends and total strangers, casting out this magic like a light into the world, as though we can’t get enough, as though this thing, this instinct to provide warmth and beauty is so deeply seated in us that once unearthed it cannot be denied. It takes on a life of its own. Our houses fill with yarn, and needles, and tools. 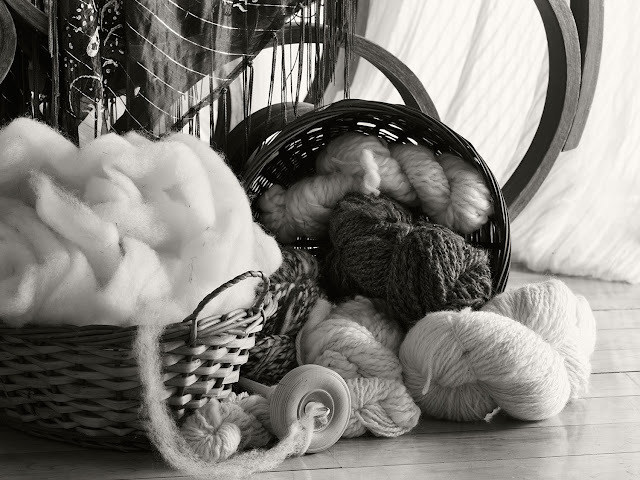 We find new outlets for this instinct; weaving, crochet, sewing, spinning, dying. And through it all is this deep peace, this zen, a tranquility brought of purpose. I can’t tell you how many times I’ve heard the phrase, “I knit so I don’t kill people.” I can’t tell you how many times I’ve said it. What’s new for me this winter isn’t the knitting, but the fact that for the first time I am part of a community while I do it. I have a weekly knitter’s group, and what looks to be a newly formed monthly spinner’s group. And I’ll tell you, if there’s anything better than knitting, it’s talking and knitting. And through this whole process, soup to nuts, I’m resting and re-evaluating. As I gather more wool, and complete more projects, my mind is turned towards the coming spring. My resting is nearly finished, and the call of the earth grows stronger within me every day. Projects for house and homestead have started their inexorable lure, the wheel of the seasons turns ever onward, and I find myself turning with it. Beautiful post, Rachel, and so very true. I also did less blogging in the fall, used the time, as you, to slow and reflect and renew, and am now recharged and ready for springtime. Hope all is well on the mountaintop!